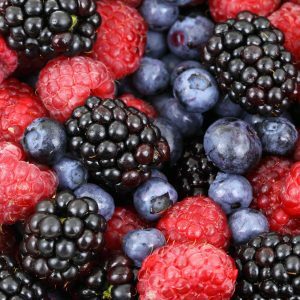 Eating more anti-angiogenic foods for cancer is an excellent way to help prevent cancer, as well as enhance your cancer treatment and prevention of recurrence. In his fascinating TED Talk, Dr. William Li explains how we can use certain foods to starve cancer cells from ever growing into something harmful. Let’s first get a few things clear about cancer and angiogenesis. As many as 95% of cancers are related to lifestyle and environment. Your habits (such as smoking), diet (red meat and processed meats, especially), alcohol, and environment (pollution and exposure to carcinogenic chemicals) all affect your risk of cancer. Many cancers are caused by diet. Around 30-35% of cancers are caused by lifestyle and environment. Eating certain foods, and staying away from others, can prevent many cancers from occurring in the first place. Without blood, cancer cannot survive. Cancer cells needs blood to grow and multiply. Without blood, they remain harmless. Angiogenesis is a hallmark of cancer. Angiogenesis means the overproduction of blood vessels in the body. And this blood, in turn, can feed cancer cells. Angiogenesis is a characteristic of every single type of cancer. Anti-angiogenesis means the prevention of the growth of blood vessels. If we can prevent blood vessels from growing, we can prevent blood from feeding the cancer – thereby starving out the cancer. It might surprise you to know that many of us already have microscopic cancers somewhere in our body. By the time we reach old age, almost all of us will have them. We need to be do our best, then, to prevent these microscopic cancers from developing further and turning into disease. 40% of women between the ages 40 and 50 have microscopic cancers in their breasts. About 50% of men in their 50s and 60s have microscopic prostate cancers. Virtually 100% of us, by the time we reach our 70s, will have microscopic cancers growing in our thyroid. 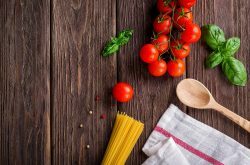 By simply eating more tomato sauce and other tomato-rich dishes, men can lower their risk of prostate cancer by half! That’s powerful stuff, don’t you think? Dr. Li’s research shows that if we can prevent the growth of blood vessels that feed a tumour, we can prevent that tumour from turning into disease. There is so much that we have control over when it comes to cancer prevention. 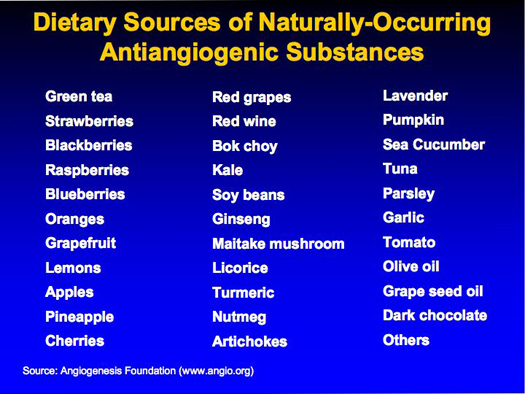 Take a look at this list of anti-angiogenic foods and then commit to adding them into your daily diet. It shouldn’t be too hard – after all, there are plenty of tasty dishes that you can make with these nutrient-packed ingredients: fruit salads, stews, soups, veggie salads, smoothies, stir fries…the list goes on. Dark chocolate and red wine are even on the list! So make a plan to start eating more of them, today. Because your knowledge is only as useful as the actions you take. This is why CTOAM offers personalized nutraceutical diets for cancer prevention, in addition to diets cancer treatment and prevention of recurrence. 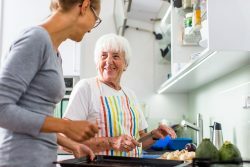 Our personalized diets are based on the latest peer-reviewed, scientific data: nutraceuticals are foods (including anti-angiogenic foods) and supplements that have been proven by science to combat the specific genetic mutations driving your cancer, or the genetic mutations that you may be most at risk for. Simply put, scientific research shows that when you eat cancer-fighting foods, you can significantly decrease your cancer risk, or speed up recovery. Please be aware – there are many diets out there that claim to prevent or treat cancer, without having any evidence whatsoever to prove their efficacy. It’s really important that you choose your cancer-fighting foods based on scientific evidence, rather than from hype, diet trends, or the advice of a well-meaning friend. Otherwise, you may very well be wasting your time, money, and effort all for nothing – and giving cancer a chance to grow in the meantime. Use Your Knowledge and Take Action Today! Ready to take your first step towards feeling better? Know that you’re doing all you can for your health – sign up today for your Free Phone Consultation with CTOAM’s cancer experts! Take the first step in preventing cancer by booking a Free Phone Consultation with CTOAM’s cancer experts. You’ll find out how to get the best personalized diet for your specific genetics, as well as fitness plans and self-care routines for personalized cancer prevention. You have truly nothing to lose and everything to gain. Questions or concerns? To speak with our specialists about genetic testing, PET/CT, targeted treatments, or treatment monitoring, contact us. We are here for you. With cancer, time is of the essence and knowledge is power.